Just back from Baltimore Comicon and the Diamond Retailer Summit, where it was great to talk about the industry with a lot of very smart people — including the folks that have generated the sales charts studied here for years. And the beat goes on — with the rollout of Top 10 lists and market shares for September 2009. 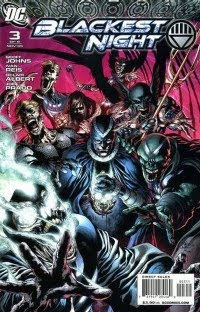 As the charts behind the link show, it was basically a static month at the very top of the list: Blackest Night #3 was the top seller, the series repeating in the top spot. The order of the next three was also identical to August 2009, with the September issues of Captain America: Reborn, Batman and Robin, and Green Lantern reprising their rankings from the month before. The $4.99 Wolverine Giant-Size issue was the top debut, at fifth place. The trade paperback list was led by the fifth Buffy Season Eight trade. The seventh DMZ trade ranked in third place; I had a nice conversation with series creator Brian Wood at Baltimore, who has raised many good points online about the things that the Diamond charts don't capture. As I've mentioned here many times before, the fine print's here on the site for a reason — and it's always good to remember what the charts are and what they aren't. The detailed figures and my estimates should be along soon. Stay tuned!